The weeks leading up the the 2016 January VHF contest saw lots and lots of snow falling at higher altitudes in the Pacific Northwest. There was no snow in the lowlands West of the Cascade mountains, but it only took a couple thousand feed of elevation gain to put a rover in the white muck. Consequently, planning for the contest occurred later than usual. A week before the contest, some of the roads to my favorite rover stops were listed as closed and even gated. In the end, I finished planning for a new route the evening before the contest that included one new stop. And, for a little spice, I added a mid-contest SOTA activation to the mix. The route for day 1 was identical to most of my recent ARRL VHF contests. The starting point is Ocean Shores, this time in CN77 along a small dirt road that leads to the waterfront of Grays Harbor. A mile to the south, at the Ocean Shores airport parking lot, is the second stop in CN76. This is followed by a long trek to the north side of Green Mountain just east of Kalama, WA. Five miles to the south is the other side of Green Mountain, where a friend allows me past his gate and onto an awesome piece of undeveloped land in CN85. From there is a trip south to the Columbia River gorge where I can reach CN95 in N. Bonneville, WA. The planned stops for 2016; Saturday is in red and Sunday is in green (click for larger image). The route for day two was substantially different from previous contests. To begin, I started north in CN88 and worked my way south (sacrificing about 2 hours of sleep as a result). Previously, I tended to go from south to north. I began on Mt. Erie (first time there) at about 1,260′ MSL. Mt. Erie is also a SOTA summit, so I took a few minutes away from the rover to do a SOTA activation. The next stop was the Lime Kiln trailhead in Granite Falls, WA. I’ve used this 600′ location before, and it isn’t too bad. In most recent contests, however, I’ve set up at about 3,000′ on the side of Mt. Pilchuck, which is a MUCH better location. Alas, the road to Mt. Pilchuck was reported to be gated well before my stop. The next stop was Central Park in Issaquah, WA. I’ve stopped here in one previous contest and one previous sprint. The location is awesome, with a parking lot that is split between CN97 and CN87 and with rotaries at the far end of each side. From there I headed to Carbonado, WA along Mowich Rd (Hwy 165), which climbs through 2000′ in CN87 and then up to 3,000′ feet in CN86, before transitioning into CN96. This is my favorite roving spot in the whole world. The road was reported to be closed, but I had a feeling I could make it to my CN96 stop. The equipment list changed a bit this contest. Three rigs took care of SSB and CW on the four bands a limited rover is allowed. A Kenwood TS-480 served for both 6m and as an IF rig for a Elecraft XV222 transverter (222 MHz). SSB and CW on two meters and 432 MHz were each handled by a pair of FT-857Ds. The rigs for FM simplex were new. Previously I used an old dual band Alinco for 6m and 2m, a Jetstream on 222 Mhz and an Alinco 6m radio. This contest, I replaced the three FM rigs with two quad-band TYT TH-9800s. One radio does 10m/6m/2m/432 MHz and the other does 10m/6m/2m/222 MHz. The rigs have dual receive with separate volume and squelch controls. Therefore, I set one up for 52.525 MHz and 223.5 MHz and the other up for 2m and 446.0 MHz. The radio rack strapped to the passenger seat. All radio heads are remotely mounted (below). The remote heads of the five radios were placed on a panel on the center console, making them easy to see and manipulate. Two HD-73 rotor controls, powered by a 600 watt inverter, turned the front and rear rotors. Two RF Concepts and two TE System bricks brought power up to near the maximum allowed for a limited rover on the four SSB/CW bands. Additionally, a Mirage C2512G was used to boost the 223.5 MHz FM signal to near 100W. Given that most QSOs on the 222 MHz band are on 223.5 MHz FM, it seems prudent to add a few extra db from an amp. The panel of radio heads seen from the operating position. A dash-mounted cell phone provided a 24 hour clock for (paper) logging, and a second cell phone displayed my current grid. A TomTom GPS was programmed with all grid crossings, stops, and each day’s route. Other pieces of equipment include a K1EL Winkeyer loaded with CW macros, a N8XJK Super Booster, a homebuilt remote antenna switch, and a 3-position switch to switch the CW paddle between the three CW-capable rigs. For 222 MHz, a cross-over switch flips the SSB and FM rigs between the front and rear antennas. Mag-mount whips were used for 6m, 2m and 440 MHz FM. I left home at 7:30am and arrived at CN77 in Ocean Shores about 25 minutes before the start of the contest. I had arranged to contact Etienne, K7ATN/R, in order to ensure we could make QSOs as the contest started. He was in CN76 down the coast in Oregon, but we could only hear each other on 6m and 2m, and quickly worked each other on those bands as the contest began. Stations from the Puget Sound area dominated the QSOs, but Johnny, KE7V, popped up on 6m from CN88 with a surprisingly strong signal. He is near Port Angeles on the other side of the Olympic mountains from my location. John, KF7PCL, who lives a short distance away in CN76, worked me on three bands. The last QSO in the grid was with Greg, K7YDL from the Portland area. An hour and a half into the contest, I was working stations a mile down the road in CN76. This time I worked K7ATN/R (now in CN86) on three bands, and worked KE7MSU/R in CN86 on three as well. A fun surprise was working Ray, W7GLF, from his portable mountain side location in CN98 on a couple of bands. On my way to CN86, I made a brief stop in CN87 to work KF7PCL on three bands. Mike, KD7TS, worked me on 4 bands from his portable mountain top location in CN87. This was followed by a 3 hour trek across CN86 through hilly terrain. I managed to make about 24 QSOs en route, which is pretty good. As usual, the 1,700′ spot northwest of Green Mountain was quite productive. A highlight for me was working from this spot five other rovers: KE7MSU/R (CN85), K7GEN/R (CN86), KE7IHG/R (CN86), VE7JH/R (CN78), and VE7AFZ/R (CN89). Additionally, I worked VE7DAY in CO70. The next stop was about five miles to the south in CN85 where, from 1,785′ I had a better reach south to CN85 and a pretty good reach toward the Puget Sound grids to the north. 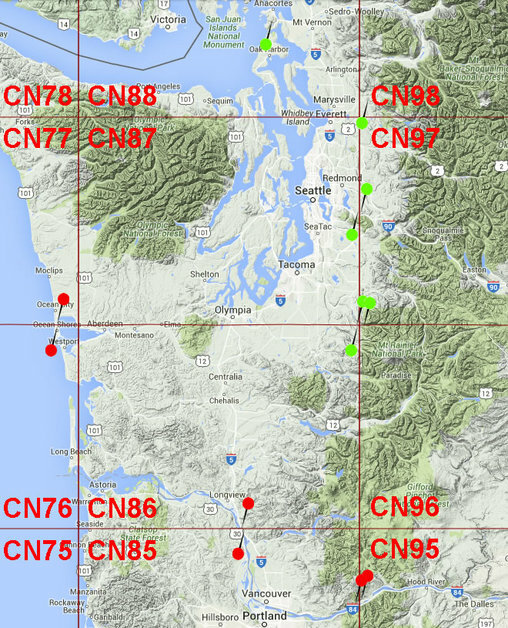 Notable QSOs include KB7W in CN93 (Bend, OR) on 2m and VE7JH/R in CN78 on 2m. After 75 minutes at this stop, I was scheduled to head toward CN95 along the Columbia River Gorge. Etienne, K7ATN/R, planned a meet-up of four rovers on the CN95/CN85 line. I was on the Washington state side of the river, and K7ATN/R, K7GEN/R, and K7NIT/R were on the Oregon side of the line. I arrived a bit late as I missed a turn off of I-5 and made an unexpected visit to Oregon (and then stopped for some very inexpensive fuel). It took us exactly an hour to work all combinations of QSOs between all four rovers. For me, it was 16 QSOS with each of the three other rovers. But the other three had additional bands. Of course, I worked a handful of stations in the Portland area as well. After the fun in N. Bonneville, I had a long 3.5 hour trek back home to Redmond, WA. Along the way, I picked up 1/2 dozen new QSOs, but mostly it was a long lonely drive. I hit the sack at 2:00am with the alarm set for 5:00am. Sunday morning I was on the road at 5:30am for the 1:40 trip to Mt. Erie outside of Anacortes, WA. This was my first visit. The mountain is part of a city park and one can drive right up to the summit between 7:00am and 10:00pm. I passed nobody on the way up…the summit was mine. Besides being a terrific VHF spot, Mt. Erie is also a 1-pt SOTA summit (W7W/SK-169). After I arrived, I closed the WW7D/R log, pulled out some equipment and scrambled to the top of a rock dome and put together a SOTA station. This was an Elecraft KX3 and some hand held radios for 1296 MHz FM and 903.2 MHz FM. I used the call WW7D for the SOTA activation. In all, I made six QSO. Most of them were on 6m, but Pete, N6ZE/R worked me on 903.2 MHz in addition to 6m. After the roughly 30 minute break for the SOTA activation, things really started happening in CN88 with about 45 QSOs. Canadians, in particular, were booming in, including VA7FC (CN79) on 3 bands, VE7FU (CN89) on 4 bands, VE7DAY (CO70) on 6m, and VE7AFZ/R (CN99) on two bands. Aside from working nothing south of CN87, this was a pretty spectacular location. Next on the agenda was a trip to Granite Falls to the Lime Kiln Trail head in CN98. I’ve used this location a couple of times in the past, but not for a few years. My preference for CN98 is Mt. Pilchuck which puts me at 3,000′ compared to 600′ at the trailhead. While the location is not spectacular for 222 MHz and 432 MHz, I was able to work VE7AFZ/R (CN99) on 6m and 2m, as well as K7YDL (CN85) on 6m and 2m. The next leg was a 1:15 trip through CN87 that produced Twenty five new QSOs–a pretty good take. I arrived at Central Park, Issaquah, CN97, about 7 minutes early while working Barry, K7BWH. One of the problems with most accessible CN97 spots is that the “Issaquah Alps” (Taylor Mtn., Tiger Mtn., Couger Mtn. Squak Mtn.) form a curtain across the middle of CN97 and CN87 that blocks signals to the north for southern locations or to the south for northern locations. This particular spot is just north of Tiger Mtn., and provides an open view west and north. To the south, there is a big gap between Tiger and Squak Mountains that opens up much to the south. There is also a gap between Squak and Couger Mountains to the southwest that opens up some rare coastal grids (CN76 and CN77). In CN97 in Central Park, Issaquah. CN87 begins on the other side of the parking island. The chief disadvantage of this location is that it is a public parking lot for a busy park. While parked in CN97, a young woman pulled up next to me trying to figure out why my truck was making her radar detector go off. I was in the middle of a string of CW QSOs and tried to interact. I wasn’t sure if her queries were deep curiosity or whether she was suspicious that I was doing something nefarious. She hung out long enough to suggest either motive. In any event, CN97 was extremely fruitful, including QSOs with KF7PCL in CN76, VE7DAY in CO70, a couple of folks in CN85 and KE7IGH/R in CN84. In all, the grid produced about 60 QSOs in 90 minutes of activation. At the appointed time, I moved 500′ to the west at the other end of the parking lot and set up for CN87. This was my 4th (and not my last) visit to the grid, so the stay here was limited to 40 minutes. The result was 25 more QSOs in the log. From there I headed to the CN87/CN97/CN86/CN96 grid intersection, where three grids (all but CN97) are available from one gravel state highway (Hwy 165) that ascends to about 3,200′ at a pull-off in CN96. I arrived in CN96 an hour ahead of schedule (5:30pm PDT) with 2.5 hours remaining in the contest. It was getting dark and there was 6″ to 12″ of snow in the pull-off that I stopped at. It wasn’t snowing when got there, but within an hour the snow started falling quite heavily. As usual from this location, QSOs were plentiful to the south, west and northwest. I worked KF7PCL in CN76 on 6m and 2m. We’ve done this before from CN96, but this time we were able to work on 432 MHz as well. To the northwest in CO70, VE7DAY was a great 6m catch. Finally, Greg (K7YDL in CN85) and I were able to work all four bands. When the CN96 QSOs dried up, I moved a mile down the road back into CN86 (for the fifth time!). There was about 45 minutes remaining after I got set up, and 18 more QSOs were the result. This included working KF7PCL on the three bands he has. The near-blizzard in CN86 turned into rain shortly after CN87, and the rain went to drizzle to nothing as I got back down to a few hundred feet above sea level. The 80 minute trip home was enhanced by shutting down the rigs and cranking up the blues from a local public radio station. There was good activity in the Pacific Northwest for this contest, including an excellent showing of other rovers (K7ATN/R, K7GEN/R, K7NIT/R, K7SCN/R, KA7RRA/R, KE7IHG/R, KE7MSU/R, N6ZE/R, VE7AFZ/R, VE7JH/R). More rovers equals more fun for everyone. So things were a little down compared to last year. It was a good contest. The roads needed were open, nothing broke, and everything went according to plans. The effort came up a little short of last year’s effort, but last year, just on account of what the rovers did, more multipliers were available. Noting to complain about for this year, though.